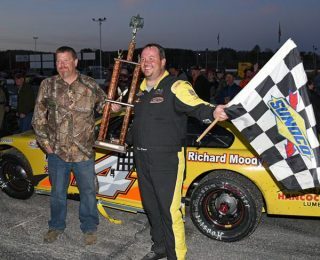 Ben Rowe of Turner edged DJ Shaw of Center Conway, New Hampshire by a razor-thin margin of .023-seconds in a wild, and wildly-competitive, Speedway Homes 150 for Pro All Stars Series Super Late Models on Sunday at Oxford Plains Speedway. Rowe started 27th, and had methodically worked his way into third position behind Bryan Kruczek of Newmarket, New Hampshire and Dan McKeage of Gorham after McKeage had led almost the entire race to that point. Rowe found an opening under Kruczek as they headed into turn one on a restart, and contact between the two as Kruczek tried to close the hole saw him bounce into McKeage, who was forced three-wide to the outside, costing him several positions. Kruczek, who had led briefly earlier in the race only to be taken out of the spot by a competitor who was penalized for the move, was unable to complete the race, while McKeage clearly deserved a far better fate than his eventual tenth-place finish. Rowe, a four-time PASS North Super Late Model champion, nearly lost the race in the same fashion that he gained the race lead on a green-white-checkered finish when he went wide to fend off the challenge of Farmingdale’s Johnny Clark, who nearly won the race after starting from 33rd on the pre-race grid. That move opened the door for 2014 series titlist Shaw to charge up on Rowe’s inside, nearly stealing the checkered flag. Rowe, Shaw and Clark were next chased across the stripe by Colchester, Vermont’s Brent Dragon, who raced up front throughout the 150-lap test to earn a fourth-place finish in the Shaw 49, with 24th-place starter, and reigning series champion Mike Rowe of Turner rounding out the top five in his new ride, a team car to his son’s winning Richard Moody Racing, Hancock Lumber-sponsored car. Mike Hopkins of Hermon, Adam Polvinen of Auburn, Glen Luce of Turner, Dave Farrington, Jr. of Jay and McKeage rounded out the top ten. Shaw, McKeage, Dragon and Matt Matheson of Oromocto, New Brunswick won Super Late Model heat races. Jeremy Davis of Tamworth, New Hampshire and Joey Doiron of Berwick took the last-chance consolation race qualifiers. Bobby Therrien of Hinesburg, Vermont cruised to a comfortable victory in the Husqvarna 100 presented by Dave’s Small Engines for the American-Canadian Tour Late Models. Therrien started sixth, and had to get by reigning ACT Late Model Tour champion Wayne Helliwell, Jr. of Dover, New Hampshire to claim a race lead that he would not relinquish. Steuben’s JR “Rockin” Robinson posted a career-high runner-up finish, holding off multi-time HP Hood Oxford 250 champion Eddie MacDonald of Rowley, Massachusetts through the closing laps and a couple of late-race restarts. MacDonald crossed the line in third position. Helliwell ended up with a fourth-place finish. Scott Dragon of Milton, Vermont filled out the top five. Ryan Robbins of Dixfield, the 2015 OPS Mods champion, turned back the challenges of the touring series invaders in the 40-lap PASS Modified main event. Robbins grabbed the lead from popular Westbrook racer Matty Sanborn, who was soon sidelined by mechanical woes. Multi-time PASS Mods champion Andy Shaw of Center Conway, New Hampshire challenged Robbins in the late stages of the race, finishing second. Robbins and Shaw were joined on the podium by North Waterboro veteran Billy Dixon, who prevailed in a three-car battle for the spot, ahead of Evan Armington of Lovell and New Gloucester’s Ben Tinker. Sanborn and Robbins won the heat races. Trevor Sanborn of East Parsonsfield was triumphant in the 25-lap Legends Cars main event. The winner’s semi-teammate, 13-year-old Austin Teras of Windham, led much of the race before settling for runner-up honors. Jarrett Butcher of Dartmouth, Nova Scotia nailed down a third-place finish in front of Buckfield’s Chris Burgess and Peter Craig of Poland. Teras and Burgess won heat races. Drivers from seven different states and five Canadian Provinces participated in the giant, opening day racing program.